Renowned Baroque flutist Andrew Bolotowsky performs the five solo flute compositions universally attributed to Bach. 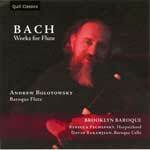 The disc also features the premiere recording of Bach expert Michael Marissen’s completion of the Sonata in A Major. With harpsichordist Rebecca Pechefsky and cellist David Bakamjian.